“A cook is only as good as her ingredients.” Shop talk is the definitive regional ingredients sourcebook. Just as Calgarians define their residence in their city by quadrant, Shop talk approaches grocery shopping by quadrant, dividing north from south, east from west. It includes a comprehensive section on local food growers, farmers’ markets in and around Calgary, and sections on Asian, East Indian, Middle Eastern and European ingredients, Bakeries, Kitchenware shops, cheese and dairy retailers, fishmongers, meat markets, and local food organizations and caterers. And… my top ten foodie movies, leading off with Babette’s Feast. The idea arose from a monthly “Market Basket” special I wrote for many months as part of my weekly “Curious Cook” column in the Calgary Herald. During the research phase, I pinned a gigantic city map to my office wall and spent all my time driving around the city, taking notes, tasting ingredients, filling my fridge with even more condiments than usual. 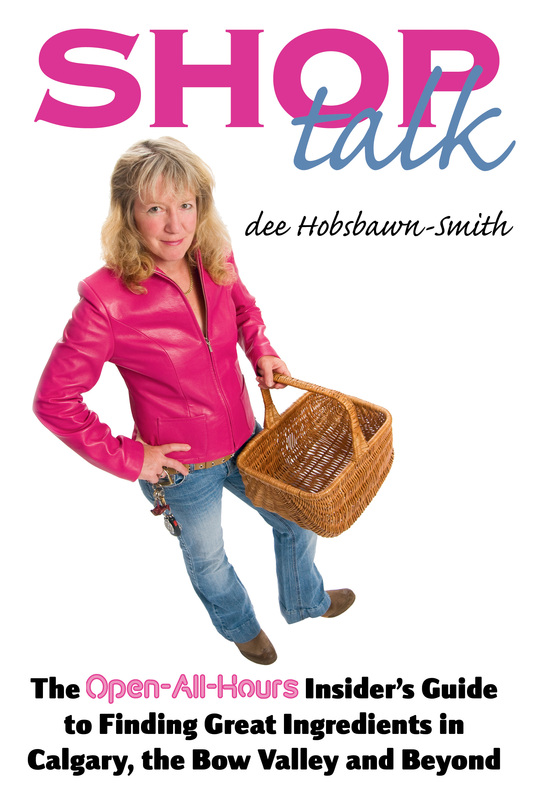 Shop talk was published in 2008.